Love the blackout in bedroom. 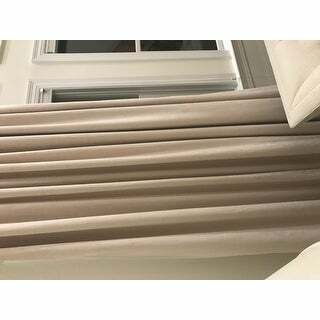 Update your room with a sensational style with this extra wide ivory velvet blackout curtain panel. Crafted with a high quality polyester velvet fabric for a luxurious look in any room in your home, the polyester thermal blackout lining keeps your electric bill down by keeping heat where it belongs and ensures a dark room so you can sleep in. These drapes are PERFECT for me! I am very happy with these beautiful drapes. My bedroom faces southeast and theses drapes have achieved what no other drape has! They darken the room, they keep the room at a more comfortable temperature, the room sounds warm and inviting and they look fantastic. And I LOVE that they are extra wide. They just look beautiful with my cream colored furniture. I now want to buy some more of these in a different color for other rooms in my house. Bought these for our houseboat, they are perfect! We needed some updated curtains for our houseboat we purchased, the previous owners and most houseboats have the floral very heavy curtains, have the white liner on the outside and thermal to keep the boat cooler/warmer( depending on the season). I purchased these and so happy with them I bought 2 pair in gray. I also purchased the polyester, which are ok, but you definitely get what you pay for. It's worth the extra money for these. They have a liner and block out the heat and light. Of course the darker the color, the more light blocked out. We have these in our master bedroom and I am soooooo happy with them. I have never posted a review on any products I have purchased, but since the reviews helped me with this product, I decided to start, hopefully it will help the next person make their decision on the purchase. We ordered the extra wide curtains in ivory. They do a good job blocking the sun. But, since they are a light color, they do not block it 100%; it is more like 85%. The extra wide curtains are great for our triple window. They are a little long and puddle nicely on the floor. We are pleased with our purchase. Finding curtains for extra wide windows is neither an easy nor inexpensive task. These drape nicely, look good, feel soft and were reasonably priced. We are pleased with our purchase. I purchased the ivory velvet blackout curtains for our Master Bedroom. We have tall French doors that open onto a patio. My old curtains were beautiful, but did not insulate. I wanted something that would help keep our bedroom warm during the winter season. I wasn't sure how I would like the ivory, but the neutral color is calming and goes well with the existing décor in the room. I prefer the new curtains due to the way they hang and keep the room warmer. The width and length of the curtains give an added elegance to the room. The curtains are soft to the touch and block out the majority of light. I love them! I bought one extra-wide panel to cover a tall narrow window, pulled back to one side. It's gorgeous. I would describe this as velour, not velvet. It's a warm ivory color, and I do see the very slight peach color in it that another reviewer mentioned. Since I'm using soft pink tones in that room, it looks great. The panel is very heavy, which also makes it drape beautifully. And the room is much warmer, since this lined panel blocks drafts really well. I'm tempted to buy a couple more panels, to do a bed crown. I was looking for some neutral curtains for my living room that I could use on the drapery hooks. These work pretty well (bunch up when you close them, but easy to spread out). They have a good look - even my picky husband agreed. A salesperson at Arhaus warned me not to get velvet panels, they would look cheap. But I disagree - these look great. They have a great look and quality! I was looking for some curtains with an extra-wide panel for our large windows in the living room. 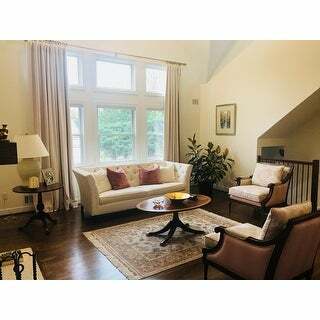 The curtains are soft to the touch, I like the ivory color and it is matched with our existing decor in the living room. Highly recommanded! I have 180 inches of window to cover and I really wanted to block the light. I already have plantation blinds on the windows but the heat and light is too much in the morning. I bought four panels and they look great! The fabric is very heavy and the panels are well made. I first ordered two to see the color and quality. I ordered two more and I couldn't believe the heat trapped behind the first two panels when I started hanging the other two! I do believe light would come through if I didn't also have blinds. I took off one star because the color is a bit darker than expected and the fabric feels more like thick ultrasued than velvet. It's very soft though and works for me. Of course they are wrinkled but a steamer can fix that. The four panels weighed 36 pounds but so far my curtain rods can handle it. I'd love to add two more panels but that might be pushing it! My master bedroom has 3 windows together 110" wide, facing west. Needless to say, it gets very hot and bright in there. Purchased these in hope to help keep both the heat and light down. I wanted extra wide so I didn't have to have a 3rd curtain in the middle window, yes there is a seam, in the middle of these, however the only person who sees this is myself, my husband would never notice this and it is only visible when the curtains are closed. The quality is great, I do take them down 2 times a year, and place in the dryer on AIR/fluff to remove any dust/lint. I did order more sets for the other bedrooms. Great value for the money. This looks like a fairly well made curtain panel, but the fabric is more like a chamois (the kind you use to clean cars) than like velvet. The fabric is very soft, almost blanket-like, but has no real body or texture as the photo seems to show. The structure of the panel comes from the blackout lining which is kind of a gray-white, not pure white or ivory. Loved everything about these. Yeah, there's a seam in the middle but so easy to hide. I will buy these again for next window treatments. They're beautiful and I have stupid high standards. I love these panels. They are soft and luxurious and added warmth to our bedroom. The color is slightly toward the peach side of ivory, but only a slight hint. I would recommend these. These drapes are worth every penny. They are rich and luxurious. The color is a beautiful soft cream (not at all yellow). They are totally room darkening and easy to hand because they have the tabs behind the rod pocket so they hang gracefully & pool softly on the floor. 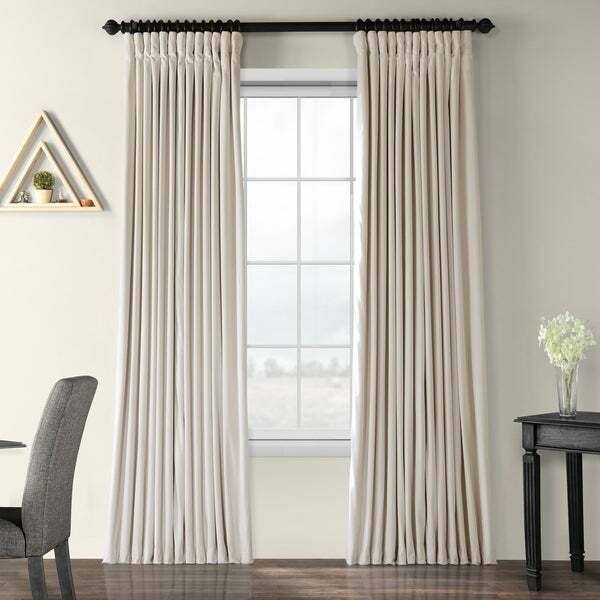 I received a request to confirm that these drapes have back tabs but I could not find any way to answer the question so I am adding it to my review. Yes, the drapes have very sturdy back tabs which are so much easier that clip on rings and make the drapes hang beautifully. I bought 4 panels to my sunny living room. I like velvet because looks reach and match my velvet living room set. Panels are heavy and good quality. They are not blackout curtains. They only filter the light. I had to purchase a separate blackout liner (right side of photo) and add it to be the back of the curtain to get the blackout. These came very well made. The velvet is soft and very nice. You can go casual or dressy with these curtains. Perfect for an oversized window. The color is creamy. Very beautiful high quality drapes. The velvet is luxurious to the touch and make the room look amazing. They are thick an heavy so make sure you buy a sturdy rod. these were absolutely perfect! everything I was looking for in a velvet curtain. weights at the bottom made them nice and heavy. These drapes are perfect. They block out every bit of light. They look so warm and welcoming. I am so glad we purchased these for our guest bedroom. I have absolutely loved these curtains! Amazing quality! "is the ivory more of a yellow tone or neutral?" More of a very light beige. Returns must be processed within 30 days of delivery. Please see this link for detailed information on our return policy - https://help.overstock.com/app/answers/detail/a_id/1. "I'm considering using one panel per window (regular-sized windows, not a sliding door) but if I do I'd like a valance. Is one available? Would that look stupid?" This is only one panel. We suggest two each window. "What is the actual color of these item? 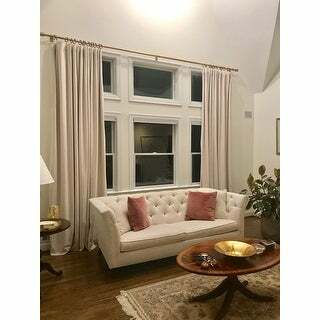 Can someone post a picture of the actual curtains? I like the color on the picture but i know some of the pictures online ate edited these days.. i want to make sure it is not dark beige or like almost brown. " I purchased these and I can say they are a true ivory. I'll try to submit a picture. Here are the curtains next to a Ralph Lauren duvet cover sold as "ivory" that has been washed and bleached many times and in my eyes has always been more of a cream. Think not as yellow as vanilla ice cream but more of a rich whole milk. I found the curtains to have more grey and don't think they had any yellow/cream at all. And they had little to no sheen. If my pictures are accepted, I don't remember if it was a sunny day, but the light in them comes through a south/southwest facing window. To me, they were less like velvet and more like good quality microfiber. Very well made, but didn't feel lush to me when hung because they were the wrong color in the room. Hope this helps. You may have better luck just ordering one for the color. Ah. Almost forgot: their tone is cool and felt cooler next to the warm duvet cover in person. I have ultra while trim in the room that provides a much more palatable contrast in my yellow room than did these curtains. "Can you take a picture of the actual item without editing. I ordered a beige color for the same company 2 months ago but the item came up like light brown. I want to make sure this is real beige color. " The panel will be a dark ivory tone similar to beige. "Hi, I live in Australia - long way from US - I'm wondering if I could get a sample of the material because it's no good if it doesn't suit my room's colours. One lady on the forum said that one of the curtains was a different from all the others she was sent - it didn't matter for her as she used it in the hallway. I don't have that leeway - hence my request for a sample - happy to pay for it and postage to make sure I get it right. Thanks,"
We do not have swatches available for this item. We don't have that option with this product, sorry. "Based on the previous questions, I assume you can hang this directly on to a traverse rod with hooks. (not looking to use the rings) There is conflicting info on whether the hooks are included or not. Please confirm and if not can you advise on how many hooks are needed per panel and if you sell the type of hooks needed. Thank you"
The panels will come with a pack of standard drapery hooks. We recommend 6 hooks per 50 inch panel.